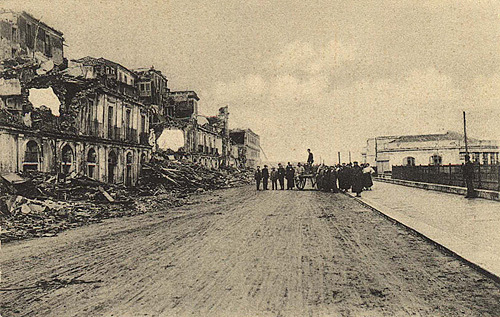 The most destructive earthquake ever to strike Europe brought devastation to the cities of Messina and Reggio Calabria on this day in 1908. With its epicentre beneath the Strait of Messina, which separates Sicily from the Italian mainland, the quake had a magnitude of 7.1 and caused the ground to shake for between 30 and 40 seconds. 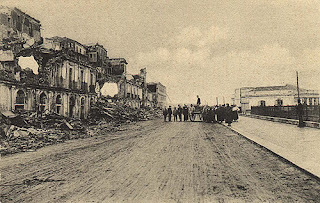 It was enough to cause such catastrophic damage that Messina, on the Sicilian side, and Reggio Calabria, on the mainland side, were almost completely destroyed. The loss of life was huge because the earthquake happened at 5.21am, when most residents were still in bed. An unknown number were swept away by the tsunami that struck both cities 10 minutes after the major tremor had stopped, when the sea on both sides of the Strait receded up to 70 metres and then rushed back towards the land, generating three massive waves, each taller than the one that preceded it, up to a height of 12 metres (39 feet). 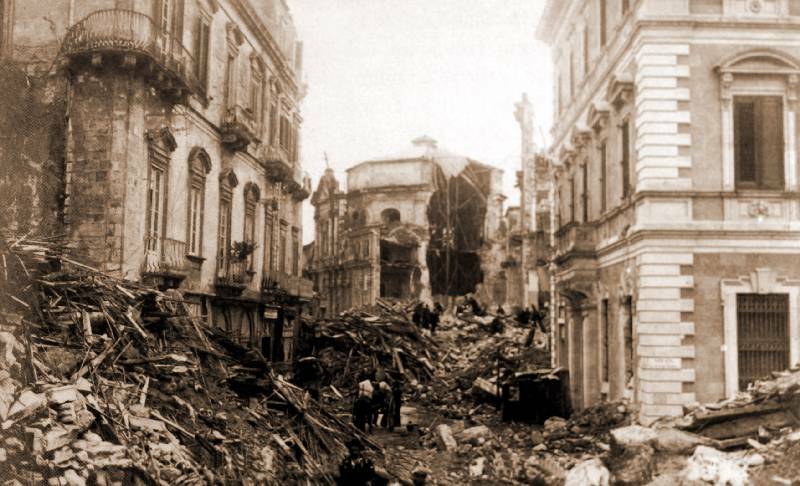 At least 75,000 people were killed in Messina alone, where 91 per cent of buildings were either destroyed or damaged beyond repair. The Norman cathedral, which had withstood a series of five quakes in 1783, was reduced this time to a partial shell. The death toll amounted to half the population of the city. Among the dead were the American consul Arthur S Cheney and his wife, Laura. The French consul and his children were killed, as was Ethel Ogston, the wife of the British Consul, Alfred, who survived. Notable Italian casualties included both the chief of police and the attorney general of Messina and the operatic tenor Angelo Gamba, who had been in the city to perform in the Giuseppe Verdi opera, Aida, and perished with his family when his hotel collapsed. In Reggio Calabria almost the whole of the historic centre was destroyed, wiping out much of the city's Greek heritage. Initial estimates were that around 25,000 people lost their lives, around a quarter of the population, but many more probably died. The tsunami destroyed the waterfront in both cities, drowning thousands of residents who had sought refuge close to the beach, away from buildings. Once calm had returned, there were virtually no doctors or hospital facilities to tend the injured, while the bodies of victims buried beneath the rubble were often not recovered until months later, or in some cases not at all. 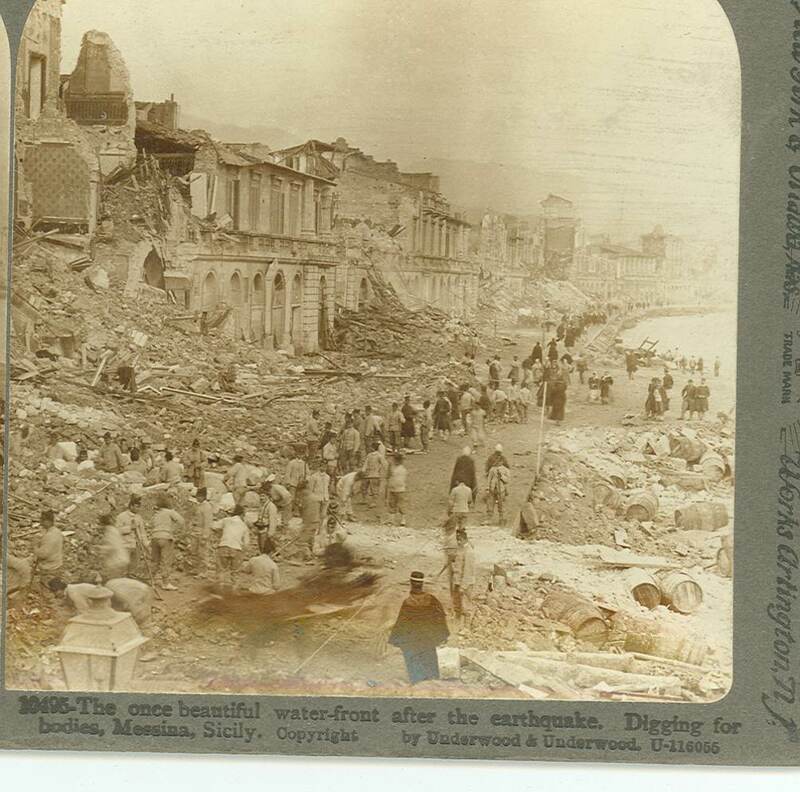 The final death toll is unknown, with the estimate of 200,000 based on comparing the numbers of residents recorded in census documents before and after the disaster. 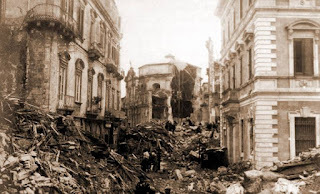 Even based on the more conservative estimates, the loss of life was the largest in a single earthquake in Italian history, eclipsing even the Naples earthquake in 1626, which was said to have killed 70,000 people. In the aftermath of the 1908 event, Europe witnessed one of the first major international rescue operations as Russia and the United States joined European nations in providing assistance. All lines of communication from the area were cut off and news of the disaster did not reach the rest of Italy until the end of the day, when an Italian naval vessel docked at Nicotera, 80km up the coast from Reggio Calabria, and the captain sent a message via telegraph lines to Giovanni Giolitti, the Italian prime minister. The Italian navy and army responded and began searching, treating the injured, providing food and water, and evacuating refugees. The rescue effort was then joined by a fleet of Russian warships on the morning of December 29 and the following day British ships started arriving from Malta. French and German ships followed suit. When news of the disaster reached the United States, where many emigrants from southern Italy had already settled, President Roosevelt offered to help and four ships were dispatched immediately to provide humanitarian aid and provisions. In the meantime, Giolitti imposed martial law, ordering that all looters be shot. King Victor Emmanuel III and Queen Elena arrived two days after the earthquake to assist the victims and survivors, many of whom had to be relocated to other parts of Sicily or Italy, or took the option of starting a new life in America. Both cities were rebuilt along the lines of modern urban areas, architect Luigi Borzi designing the new Messina, with the reconstruction of Reggio Calabria placed in the hands of the engineer Pietro De Nava, although as late as the 1950s, some families were still living in the wooden barracks that were erected as temporary housing. Messina's cathedral, which still contains the remains of King Conrad, ruler of Germany and Sicily in the 13th century, had to be almost entirely rebuilt following the earthquake, and again in 1943, after a fire triggered by Allied bombings. The original Norman structure can be recognised in the apsidal area and the façade has three late Gothic portals, dating back to the early 15th century. The tympanum dates back to 1468. 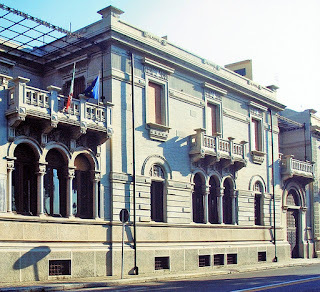 Reggio Calabria is the oldest city in Calabria, the most important in what became known as Magna Graecia - Great Greece - after settlers began to arrive in the eighth century BC. Much of its heritage was destroyed in the earthquake and the rebuilt city is notable now for its fine Liberty buildings and its linear plan. 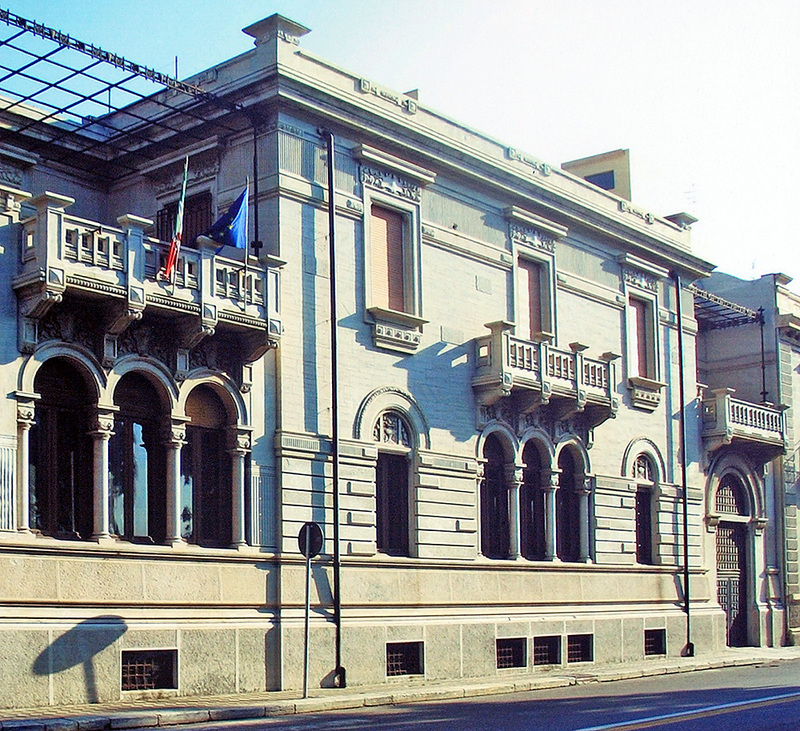 The best of what could be salvaged of the Greek remains can be seen in the National Archaeological Museum of Magna Graecia, housed in Palazzo Piacentini.